Aperture 3 Library First Aid. Of course, we should all be using a backup process to ensure our image library and database are protected and can be recovered at any time. After all, your image library probably represents years of accumulated pictures that would be difficult to replace if they ever became corrupt. Apple's Time Machine is a great choice for backups, but any of the leading backup applications will work equally well. Before you try restoring from a backup to fix issues with Aperture 3, give Aperture's Library First Aid tool a chance to repair any inconsistencies. Quit Aperture 3 if it is currently open. Press and hold the option and command keys while you launch Aperture 3. The Aperture Library First Aid utility will launch, and provide three different repair processes you can perform. Repair Permissions: Examines your library for permissions problems and repairs them. This requires Administrator access. Repair Database: Checks for inconsistencies in your library and repairs them. Rebuild Database: Examines and rebuilds your database. This option should be used only when repairs to the database or permissions do not address library problems. 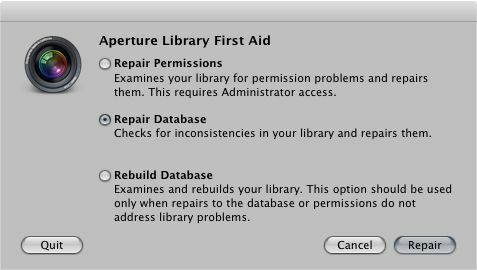 You should consider using both Repair Permissions and Repair Database whenever you need to run the Aperture Library First Aid utility. The third option, Rebuild Database, should only be used as a last resort. You should have a current backup of your Aperture 3 library and database before you use the Rebuild Database option. Provide your Administrator credentials, if needed. Aperture Library First Aid will run the Repair Permissions command, and then launch Aperture 3. Aperture Library First Aid will run the Repair Database command, and then launch Aperture 3. If Aperture 3 and your libraries seem to be working correctly, you're done, and can continue using Aperture 3. If you're still having a problem with Aperture 3, you may want to run the Rebuild Database option. Before you do, make sure you have a current backup, in the form of a Time Machine or third-party application backup. At a bare minimum, you should have a current Vault, Aperture's built-in backup of image masters. Remember: Vaults do not include Reference Masters you may have stored outside of Aperture's library system. Aperture Library First Aid will run the Rebuild Database command. This can take a little while, depending on the size of the library and its database. When finished, Aperture 3 will launch. If Aperture 3 and your libraries seem to be working correctly, you're done, and can continue using Aperture 3.